At Washington STEM, we’re always looking for examples of innovative STEM instruction. So when we had the chance to chat with Al Gonzalez, sixth grade science and technology teacher in the Chimacum School District, we jumped on it. At Chimacum Middle School, Al is putting his 25-year teaching history to good use with bright examples of STEM teaching, particularly in computer science, environmental stewardship, and underwater sensor technology. His National Board Certification as an Early Adolescent Generalist means, he says, he is an “integrationist at heart.” STEM, to him, is about incorporating all subject areas and their corresponding varied skills in student work – not just teaching each subject on its own in isolation. Al is always looking to get his students into the field, whether it’s launching rockets or building sensors to measure real-world data. Lately, Al’s integrative work on computer science and career connected learning has taken a turn for the spherical. In addition to his students participating in the Hour of Code every year, Al recently obtained a grant to purchase two Sphero robotic balls so he could start incorporating coding into his teaching of Newton’s Laws of Motion. (A Sphero ball is a robotic sphere that can be controlled via smartphone or tablet.) In a typical lesson, Al will have students make stop motion animation videos about each law and then design an experiment using the Sphero to test that law. Once he approves their design, students begin to learn Orb Basic, the Sphero programming language, to program the Sphero to carry out their experiment. Al’s students’ environmental stewardship project combines disciplines of ecology, biology, and environmental management to work with restoration professionals from the North Olympic Salmon Coalition. Al brings the restoration experts in to get his sixth graders planting trees, learning about local watershed and climate change, and using benthic macroinvertebrates to determine the biological integrity of a nearby creek. Not only is this experience academically rich, it also lets students see how careers can get them working outdoors and helping their environment. Al’s involvement with the Olympic STEM Pathways Partnership (OSPP) has brought his teaching to new depths. 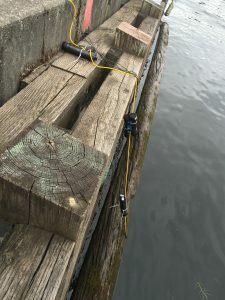 Through collaboration with the University of Washington school of oceanography, he and some teaching colleagues built underwater temperature sensors to collect ocean data – such as getting information on the Juan De Fuca tectonic plate, which lies 9,000 ft deep in the Pacific Ocean. This exercise was designed to teach educators how to build a sensor, create opportunities for collaborative sensor building in the classroom, and how to use information students collect from the sensor to ask questions about short- and long-term patterns in underwater environments. Al used the knowledge gained through this exercise to implement his own temperature data project with his students. His sixth graders use a temperature probe to get readings on their neighborhood creek, Chimacum Creek, and the probe allows them to record the amount of dissolved oxygen, pH, turbidity, flow rate, and temperature of the water. The OSPP has allowed his class to obtain guidance from scientists at the University of Washington, who helped the class program, connect, and build sensor housings for the probe. Throughout his teaching, it’s clear that Al enacts his passion for collaboration in every lesson. “When engineers and scientists get together to build a space shuttle, for example, they don’t work in isolation and then come together and hope all their pieces fit. They have to work as a team using multiple disciplines to get that space shuttle built and ready for launch on schedule.” With an undergraduate background in psychology, training in the martial arts, and a Master of Arts in Teaching, Al blazes the way as an astute interdisciplinarian himself. At Washington STEM, our number one goal is helping students across the state access high-quality STEM education like the kind found in Al’s classrooms. Our legislative priorities help us create a coordinated effort among our Networks, policymakers, and colleagues in education. Your support for our legislative asks will help us expand Al’s work to more schools and classrooms across Washington. Want to read more from Al? Check out his blog at http://www.educatoral.com/wordpress/. NextCOMPUTER SCIENCE: MORE OF AN ART OR A SCIENCE?